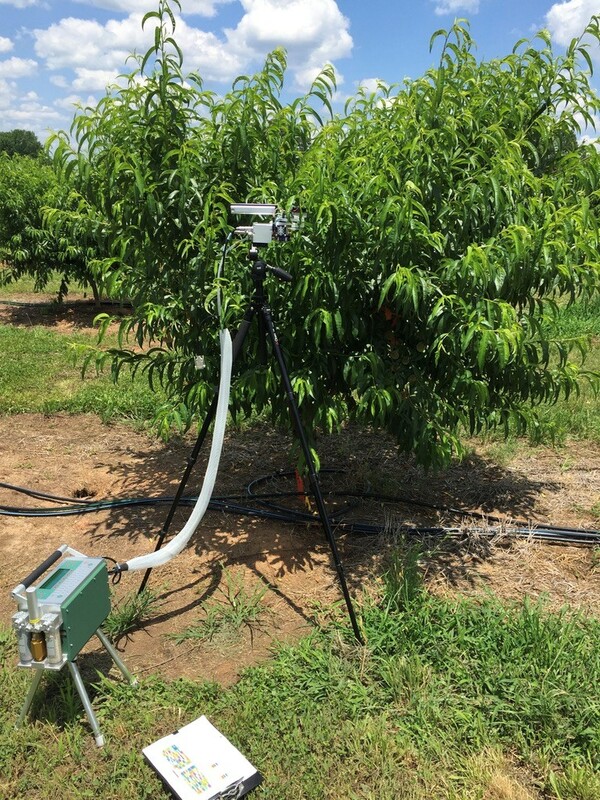 After a couple years of research on irrigation and fertilization of young peach plants at the University of Georgia, encouraging results are guiding further research to develop new guidelines for irrigation and fertilization practices for the southeastern United States. Accurate and precise irrigation and fertilization management for agricultural crops have become a priority and an interesting topic of research, largely because of the current problems with drought and fertilizer runoff affecting several regions of the world, including the State of Georgia. Drought stress and unsuited fertilization negatively affect plant growth, impacting plant establishment in the field, reducing the development of healthy foliage, and decreasing fruit size and yield. The specific objective of the research is to investigate the performance of young peach plants under different irrigation and fertilization conditions, which may create opportunities to increase production efficiency and sustainability. The main goal of the project is to improve the irrigation and fertilization recommendations for young peach plants, since traditionally, young peach plants do not have irrigation available until two or three years after field planting, and the fertilizer recommendations might not be well adapted to the southeastern U.S. Some irrigation studies were performed in the past; however, most of them were done in Mediterranean regions and in California, being not directly applicable to the southeastern United States. On the other hand, current fertilizer recommendations for the southeastern United States are believed to be based on studies from the mid-1900s and/or studies performed under environmental conditions not representative of the southeast environment, which leaves room for potential yield increases and sustainability’s improvement. Plants of ‘Julyprince’ peach variety grafted onto ‘Guardian’ rootstock were planted in July-August 2015 (145 plants/acre) at the Dempsey Farm, University of Georgia, Griffin, GA, which has Cecil soils, containing clay and loam predominantly (Figure 1). Figure 1. ‘Julyprince’ peach variety grafted onto ‘Guardian’ rootstock, planted at the Dempsey Farm, University of Georgia, Griffin, GA.
Two irrigation levels are being tested: no irrigation and optimum irrigation based on the volumetric water content (VWC) of the soil, varying from 15% to 25% accordingly to the period of the season. 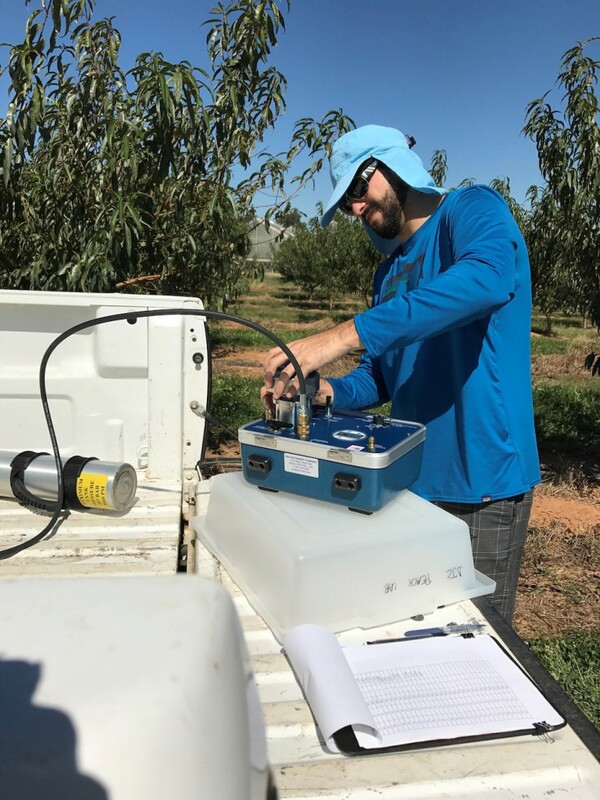 The irrigation system is controlled automatically using soil moisture sensors connected to a base station, which collects the VWC of the soil every 20 min and turns the irrigation solenoid valves ON or OFF in order to keep the VWC values above the optimum irrigation levels previously described (Figure 2). Figure 2. Graphic demonstration of how the irrigation system kept the volumetric water content of the soil (thinner colored lines) above the established thresholds (25% and 20% for the selected period from 07/01/16 to 10/03/16). 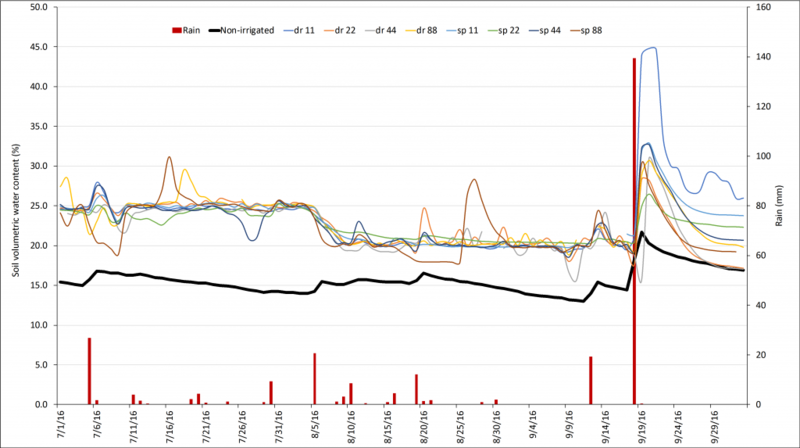 The thicker black line shows the non-irrigated treatment, which always had smaller soil water content than the irrigated plants. The red bars represent the rain events. The irrigated plants are divided in two, to test micro-sprinkler versus drip irrigated plants. For the micro-sprinkler, one nozzle per plant is used; and for the drip, 4 emitters per plant are used simulating a double row of irrigation lines. For either micro-sprinkler and drip irrigation, the irrigation rate is the same: 8 gallons per hour. In addition, four fertilization levels are being tested following the recommendation of the Southeastern Peach, Nectarine, and Plum Pest Management and Culture Guide, being the amount of nitrogen in each level as follow: 1) 25% of the current recommendation; 2) 50% of the current recommendation; 3) 100% of the current recommendation; and 4) 200% of the current recommendation. Granular fertilizer is applied by hand (one application of 10-10-10 NPK and 2 applications of 15.5-0-0 NPK). We measured trunk cross-sectional area, canopy volume, leaf and stem water potential (Figure 3), photosynthetic rate (Figure 4), and commercial fruit yield. Trunk cross sectional area and canopy volume are good descriptors of the plant growth and development; leaf and stem water potential give a good idea of how much water stress the plants are suffering; and photosynthetic rate gives an idea of the plants’ capacity to generate energy to support its growth and development. Data was collected in 2016 and 2017 seasons. Figure 3. Pressure chamber instrument being utilized to measure stem water potential. Figure 4. Portable photosynthesis system measuring the photosynthetic activity of the plant. Irrigated plants grew more than non-irrigated plants, with trunk cross-sectional area and canopy volume ~1.5X and ~1.7X greater, respectively, for both years (Table 1). Table 1. Trunk cross-sectional area and canopy volume of ‘Julyprince’ peach plants grafted onto ‘Guardian’ rootstock in 2016 and 2017. * Irrigated plants had significant greater values than non-irrigated plants. If plants were drip irrigated, all fertilizer rates induced the same values of trunk cross-sectional area and canopy volume. However, when micro-sprinkler irrigated, plants with the highest fertilizer rate had the greatest trunk cross-sectional area and canopy volume, reaching similar values than the drip irrigated plants. Irrigation alleviated drought stress in 2016, increasing water potential and photosynthesis by ~0.6X and ~1.8X, respectively, for both years. However, no significant physiological responses were found in 2017, likely because it rained more than in 2016. 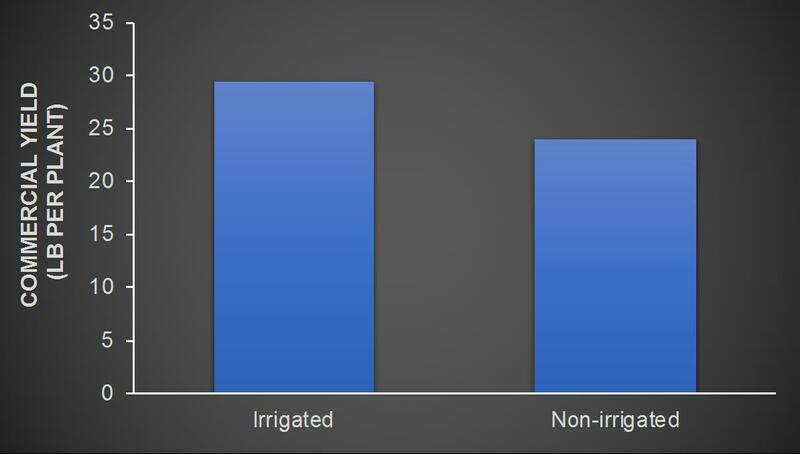 The negative effects of the lack of precipitation in 2016 carried over to 2017: the commercial yield of non-irrigated plants was ~20% lower when compared to irrigated plants (Figure 5). The fertilizer rates did not induce major differences for water potential, photosynthesis, and commercial yield (Figure 6). Compared to micro-sprinklers, drip irrigation increased stem water potential and photosynthesis in 2016, and commercial yield in 2017 (Figure 7), while applying ~36% less water. Figure 5. Commercial yield of ‘Julyprince’ peach plants grafted onto ‘Guardian’ rootstock in 2017. Irrigated plants significantly yielded ~20% more than non-irrigated plants. Figure 6. Commercial yield of ‘Julyprince’ peach plants grafted onto ‘Guardian’ rootstock in 2017. No significant differences among fertilizer rates were found. Figure 7. 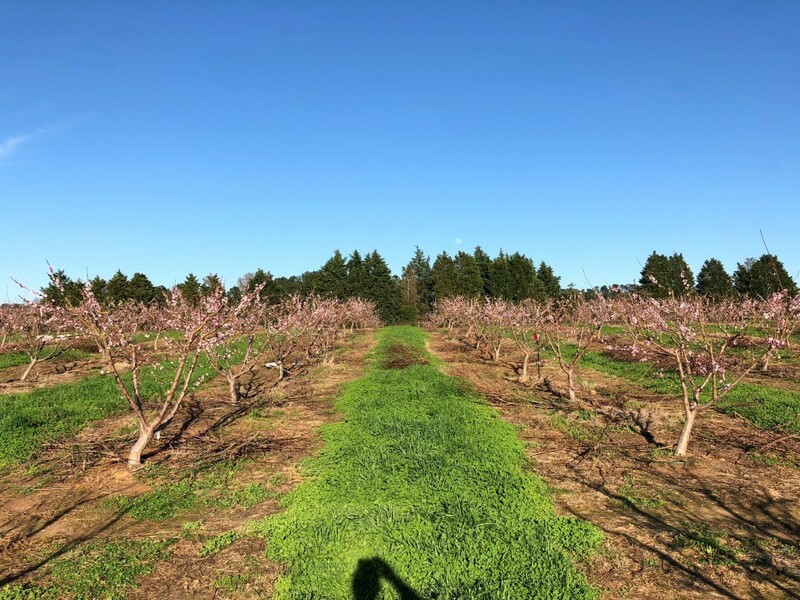 Commercial yield of ‘Julyprince’ peach plants grafted onto ‘Guardian’ rootstock in 2017. Drip irrigated plants significantly yielded ~20% more than micro-sprinkler irrigated plants. Irrigated plants had a better development than non-irrigated plants, and the results were more pronounced in 2016, with clear differences in trunk cross-sectional area, canopy volume, water potential, and photosynthetic rate. The 2016 growing season (April to August) was considered dry, raining only 431mm, a large reduction when comparing with the historical precipitation for the period, which is 586mm. Differently, the 2017 growing season (April to August) was rainy, raining exactly the same amount than the historical data (586mm). Even though the precipitation was normal in 2017, the commercial yield was negatively affected likely because of the 2016 season. Surprisingly, the fertilizer rates did not induce major differences on the variables evaluated. This provides relevant indication that we can accept our hypothesis that the current fertilizer recommendations are not well suited for the region, warranting studies to determine the optimum fertilizer rate. Drip irrigation appears to induce better results than micro-sprinkler for the variables evaluated, because drip directly applies water in the soil line, whereas sprinkler creates a spray of water above the soil line, and some water is lost through evaporation, reducing the efficiency of the irrigation system. It is important to cite that drip irrigation might be beneficial for our soil conditions (with more clay than sand) because the water can move laterally and down in the soil profile because the characteristics of the soil. However, for sandy soils, the water mainly moves down in the soil profile, with minimum lateral movement. Thus, for sandy soils, micro-sprinkler might be better suited because it allows for a better distribution of water around the plant. Drip irrigation was proven to be beneficial to young peach plants’ development and production. Even when we have a good rainy year like 2017, the negative effects from dry years (like 2016) are carried over from one year to another year and can be mitigated by irrigation. Because the southeastern U.S. is frequently suffering with drought, it is important to irrigate to avoid negative carry over effects. 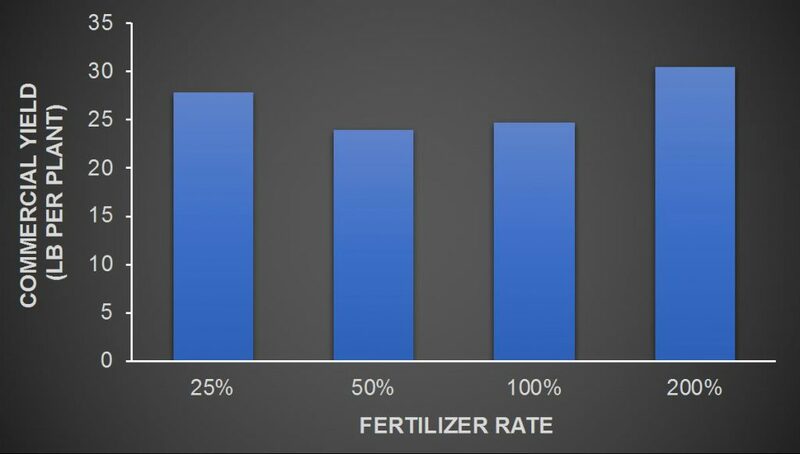 Additionally, fertilization rates can be cutback to reduce the environmental impacts and increase growers’ profit. Although these initial years of research were successful in assessing if irrigating young peach would be beneficial and in determining how much fertilizer these young plants actually need, additional years of research are needed to fine tune the irrigation guidelines and to evaluate the reduction of fertilizer in a long term, assessing if any nutritional depletion will arise. Currently, no nutritional deficiency was reported with foliar analyses, being the nutrient values within adequate ranges. Bruno Casamali, PhD Graduate Student, Peach Research and Extension Program, Department of Horticulture, University of Georgia, Griffin, GA.
Dr. Dario J. Chavez, Assistant Professor and Peach Research and Extension Specialist, Department of Horticulture, University of Georgia, Griffin, GA.
Posted in Horticulture. Bookmark the permalink.